Several versions of the story have appeared with regard to the event that took place in Hidalgo on February 10, 2010. First, it was a meteorite, then Russian space junk and now, a new channel of investigation presents itself. Multiple reports were received on February 10 regarding the sighting of a fireball crossing the skies over Mexico. Messages and phone calls came mainly from the states of Hidalgo and Puebla; some residents of Mexico City also claim having seen the phenomenon. The initial version that appeared in the media suggested that it was a meteorite. Later on, the likelihood of space junk (a fragment of the Cosmos 2421 satellite) was put forward, but the Russian government dismissed this information, stating that none of their space artifacts fell on Mexican territory on the date in question. The authorities and independent research groups have tried to located physical evidence that may enable us to determine with certainty what happened that afternoon. However, their efforts have been fruitless to date. As I wrote in another installment, I learned of the incident by the messages I received (via e-mail) from residents of Hidalgo and Puebla) telling me their experiences, going as far as to quote a letter from Héctor Pérez. As fate would have it, it turns out that Hector is the brother of Lic. 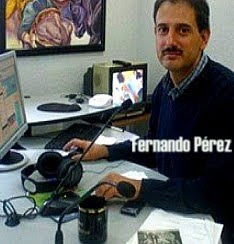 Fernando Pérez, a newscaster with XENQ. Bear in mind that this was this radio station received the story first. On February 12 I received a letter from Lic. Fernando Pérez telling me that he was not in agreement with the Russian space junk hypothesis. Furthermore, he was aware of an eyewitness account that should be considered during the investigation. 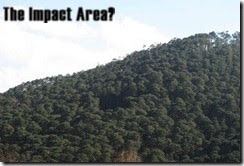 This was the eyewitness account of Francisco Roldán, who claims having seen a device (resembling a multiple-pronged piñata) descending into the mountains near Cuautepec before rising again. According to the witness, this was the cause of the detonation on the afternoon of February 10. 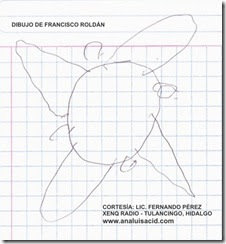 Mr. Roldán appeared before XENQ Radio on February 11 to tell his story; Mr. Pérez asked him to sketch the object he had seen. In the opinion of the renowned journalist, the witness appears to be sincere, free from guile or an urge toward self-aggrandizement. Francisco Roldán is a simple man, a cobbler who lives in Tulancingo, Hidalgo. He earns a living by going door to door and mending footwear, and it was precisely during one of his errands (near El Capulín) that he claims having witnessed a malfunctioning unidentified flying object. Francisco Roldán told the journalist that he could take him to the site where the vehicle descended to find any ground traces or remains. Contact has not been made with Roldán, as he went off to the state of Puebla and lacks a cellphone; we are waiting for him to return to point out the area and provide additional details.